Natural medicine is safe and highly efficacious and has withstood the test of time. At Agape Acupuncture, Inc., the treatments are tailored for each patient, realizing that each person needs quality care that is right for their body. We understand that each individual’s needs are different and their body works uniquely, so we craft custom treatment plans that will be effective for you. Natural medicine successfully treats a wide range of diseases and it is the most researched medical system in the world. With over 4,000 years of success, natural medicine has treated more individuals than all other types of medicine combined. Acupuncture has been well known for its reconciliation of our design and for normal functioning of the body. It treats a wide range of illnesses from moderate cases to the very difficult and is an excellent avenue to help patients promote, maintain and restore health based upon the principles of natural medicine. Natural Medicine is a time proven medical system, and is in fact, traditional medicine. With over 4000 years of history, use and research, more people have been treated by herbs and acupuncture than all systems of medicine combined. Our desire is to share Natural Medicine with you and to make a difference in your health and healing process. We offer gentle loving care to our patients and will do our best to serve your healthcare needs. We treat a wide range of illnesses from moderate cases to the very difficult and natural medicine is an excellent avenue to help patients promote, maintain and restore health. Researched and established for over 4000 years, Natural Medicine is the longest practiced and most used medical system. Natural Medicine is the grandfather of all medicines and it is traditional in every sense of the word. Most people think of it as complimentary medicine or alternative medicine but it is not. Natural medicine has treated more patients than all systems of medicine combined. It has a wealth of knowledge to share, thousands of years of wisdom to impart, and treatment methods that have been time proven through case histories. Treating the entire body as an functioning unit is called WHOLISTIC medicine. This is where the word “wholistic” stems from because it considers the whole entire body as a functioning unit: mind, body and spirit. Natural Medicine is just that, there is nothing magical or mystical about it. It originated in Eastern asia, mainly China, and is now utilized in countries, such as Switzerland, United States, Canada, Russia, Romania, Czechoslovakia, Yugoslavia, Mexico, China, Korea, Japan, India, Germany, France, Britain, and Australia. It is widely used all over the world as a part of mainstream medicine. In the United States, it is being increasingly sought after, and according to Time Magazine (Fall, 1996), over 13 billion dollars are spent out of pocket by Americans annually. People seek after natural medicine for its methods of treatment are being both safe and effective. The harshness of drugs, and irreversible procedures, such as surgery are not involved. Natural Medicine’s main component is that it releases the body’s own healing power to help fight off diseases. When the immune system of the body is weak, illnesses will occurred. With the placement of natural medicine, it increases the body’s strength and balances its functions, which allows for the ailment to be eliminated naturally. The body should not to be easily cut into and vital components to be cut out. We believe that surgeries are always the last option because it is a death sentence to that organ and/or organ system. At the end, the patient has two choices in medicine for their health and well-being – one way is with natural healing the other is with unnatural drugs and surgeries. Over 4,000 years of history for this traditional medicine that has been practiced and used more than all medical systems combined. Natural Medicine has proven is credibility and stood the test of time to be the longest and most widely used medicine. All studies and application have been used on humans only. Natural medicine did not thrive on animal testing nor did it derive its efficacy from the responses from animals. Natural Medicine treatment methods have been time proven through human case histories. The safety and effectiveness of Natural Medicine when applied by a licensed professional has vast benefits for patients. For over 200 years, standard medical treatment in the United States and in the majority of the world has been solely based on chemical drugs and surgical procedures – a sign that the medical system is failing. It is concerning to all when doctors are not treating the real cause of the disease and are instead covering up symptoms and masking the pain. The 21st century is to refocus and redirect medicine, and many are turning back to traditional natural medicine – a development to address the gaps in modern medicine. Drugs and surgeries are not the first choice for many patients these days. Natural Medicine, such as acupuncture and herbs, are what they are turning to more and more. Most reason being that Natural Medicine is in reality less costly, less painful, and far less side effects than chemical medications and caustic surgeries. The other factor is that acupuncture helps in their recovery from chronic debilitating ailments, including degenerative diseases, difficult diseases and chronic relentless pain. Times have changed and it is bringing back natural treatments methods and promoting the body’s own healing capabilities. The United States and worldwide have seen a great demand for this way of medicine – unparalleled in history of medicine. Preventative medicine and natural medicine are key in improving the quality of life. The millions of baby-boomers are looking into traditional natural medicine to stay healthy and overcome illness or pain management issues that have beset their lives. “Due to the managed healthcare systems, the red-tape, the lack of proper care, and the perceived coldness and remoteness of the modern medical system, many Americans are becoming fed-up.” (Time Magazine, November, 1998) People have decided that surgeries and drug medications are not the answers to being healthy or overcoming their illnesses. These factors are the reasons why consumers have made Natural Medicine not just a trend but the way to achieve and receive treatment for healing and health maintenance. It is not just people in the United States but also people in other countries that are becoming concerned with the side effects of drug medication and the complications that same times accompany them. An article in the Los Angeles Times (Dated April 15th 1998) stated that, even though the drug medications were properly prescribed, over 100,000 patients death’s were reported. In another article reported by, JAMA (Journal of American Medical Association) in April, 1998 that approximately 76,000 to 137,000 patients died in 1994 from drug medication prescribed by their physicians. The correlation to numbers of the deaths from adverse reactions would make it between the sixth and fourth leading cause in the United States. Negligence has been a leading cause in the death’s of 300,000 patients in hospitals when they were under medical supervision. In a article by Time Magazine “Special Issue”, Fall 1996 reported that the above number is five times greater than the American that died in the Vietnam War. In 2010, years after the original articles were written, an analysis in the New England Journal of Medicine found that, despite efforts to improve patient safety in the past few years, the health care system hasn’t changed much at all. (New England Journal of Medicine, November 25, 2010). I was suffering with frequent bladder infections, and after medication, I still had extreme pressure. I was referred to a urologist. He gave me a scope and said I had bladder inflammation, caused by too many infections. I was informed that there is only one medication for this problem. After, taking only ten pills of the 90, I had such severe pain that I thought I was going to die. I discontinued the medication and went back to the urologist. He said there is nothing more that we can do for you until science discovers another medication. 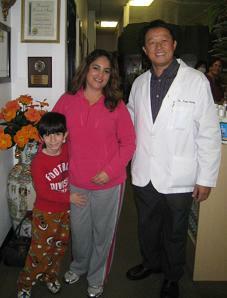 I started coming to Natural Medicine Center on February 11, 2011 and received acupuncture and herbs. I wanted to lower my FSH and get pregnant, have a baby and be healed from Premature Ovarian Failure. We were surprised and amazed about what natural medicine can do. He’s been to every treatment with me and has been very supportive. The clinic felt homey. I like it! I love it! Dr. Huang is a Christian and being asked to pray makes a tremendous difference in our lives. After my 3rd treatment, I was more energetic. My periods are still adjusting but they became better. Lab results confirmed that my FSH lowered to 9.1, normal levels. My Dad saw an article in the paper for Natural Medicine and made an appointment for me to see Dr. Huang. When I first arrived I was miserable and was sick of seeing doctors and just wanted to be healthy again. When we sat down with Dr. Huang and he laid out a plan to get me back on track. I started doing acupuncture and taking herbs and had to fully change my diet. I knew it was going to be hard but in the end it was all going to be worth it. I went to acupuncture 2-3 times a week and continued to take my herbs until I was 17. I can’t imagine my life without natural medicine. The medical staff was reassuring, friendly, kind and supportive. I didn’t expect these results but I feel very blessed by them. At first my family and friends couldn’t believe it and then a big sigh of relief that something was finally working. I praise God for the healing that has gone on in my body and can’t thank Dr. Huang and natural medicine enough for how they have changed my life. Since my twenties I have had high cholesterol and for the past 2 years my physician prescribed cholesterol medicine because my cholesterol had reached dangerous levels at 317 mg/dl. When I started my treatment with Dr. Kevin I stopped my cholesterol medicine. After 5 months of treatment I had a blood test and the results were absolutely amazing; my cholesterol levels had dropped to 177. I am 40 years old and have not had this low of a reading since I was 20 years old and in the best shape of my life. My immune system is working much better than it has in many years. I am enjoying good health and not taking all of the medications I used to take. Praise be to Jesus! I can’t stop thanking God for bringing this Godly doctor into my life. God used Dr. Kevin to heal me when my doctors told me there was nothing they could do, and he did it without pumping me full of medications. I started treatments with Natural Medicine at Agape Acupuncture in June, 2010 with acupuncture, herbal medicine and a food guide. My aunt, T.R., referred me here. I wasn’t a believer in natural medicine before coming here, but I had a lot of faith and was positive. I wanted to get well so I could have my surgery. The staff is really kind; the clinic is really quiet and clean - very trustful and friendly. My results were excellent. At Natural Medicine Center I received acupuncture, herbal medicine and a nutrition guideline. I had treatments 2-3 times a week for about 10 weeks. I took the natural herbs as well that Dr. Huang prescribed and adjusted my diet. I started to feel better after about 5-6 treatments; when I could see that I could move my shoulder a little bit more and was not having so much pain. I regained 100% mobility in my left shoulder and arm. I am pain free! It’s been so great to finally feel healthy again and be able to focus more effectively on my job and to exercise without pain. The staff at Natural Medicine Center is always helpful, pleasant and very professional and seemed to understand the patients’ needs well. Dr. Kevin Huang is great! Very smart, professional, knowledgeable and caring. He absolutely knows what he is doing and gets great results! Also, he is a very kind person and takes time to answer your questions. We immediately began treatment that same day and he gave us a run down about what type of foods to avoid, and that it would take about 3 months to prepare my body to conceive. At first, I thought, “seriously?” But we know that all we can do is just trust Dr. Huang’s recommendations. He also prescribed me some natural herbs to help with my blood and liver functions. The entire process takes a lot of time, patience and commitment. But the end result was definitely worth it. Nearly 5 months into the treatment, we found out early February that we’re pregnant and expecting our first child, a baby boy, due October 2016! It’s been almost a year since we began our acupuncture journey with Dr. Huang and have really enjoyed the entire process. We appreciate his prayers, Godly-advice and words of wisdom each time we meet. You’ll always see him happily smiling and full of energy! From 2002-2009, I sought various therapies in Atlanta and California. I tried injections, physical therapy, acupuncture, chiropractor, and different drugs before coming to Natural Medicine --- all with no change. I couldn’t walk barefoot or wear nice shoes. I couldn’t run or do exercise on my feet for long. And for years, I couldn’t sleep on my right side or back. • We invest our own time, staff hours and resources to gather information and data for our reviews and testimonials, and we do our best to keep the information as accurate as possible..
• We do not pay patients or reviewers nor do we compensate them in any way for giving us their testimonials and reviews. • We have never accepted money to publish a review/testimonial. The founders of Agape Acupuncture, Inc. have faith in knowing that Jesus is the Great Physician and the true and living God who brings healing, as we submit ourselves to provide healthcare to the patients. We realize the healing capabilities found within the body as natural medicine is applied in treating diseases. Over the years we have seen for ourselves and have been given testimonies from patients that have been healed and how natural medicine has benefited them with their illnesses. Here at Agape Acupuncture we are thankful to the Lord for entrusting us with these patients. Natural medicine is both safe and effective by itself and it also works along side with modern medicine. In our clinic, we pray for our patients daily and when the opportunity arises, we share our faith with our patients and staff. Read our statement of faith.